Use the SN and VSEPR theory to determine the electron pair geometry of the molecule. Use the VSEPR shape to determine the angles between the bonding pairs. What is the shape of #"BeCl"_2#? 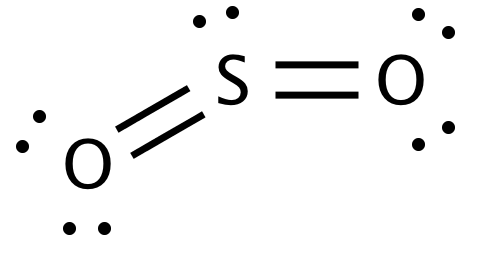 The central #"Be"# atom has two bond pairs in its outer shell (SN = 2). The shape of the molecule is linear, and the #"Cl-Be-Cl"# bond angle is 180°. What is the shape of #"BF"_3#? The #"B"# atom has three bond pairs in its outer shell. Minimizing the repulsion causes the #"F"# atoms to form an equilateral triangle about the #"B"# atom, as shown below. All the atoms are in the same plane, and the #"F-B-F"# bond angles are all 120°. What is the shape of #"SO"_2#? The central atom, #"S"#, has three groups bonded to it, two oxygen atoms and a lone pair. The electron pair geometry of #"SO"_2# is trigonal planar. 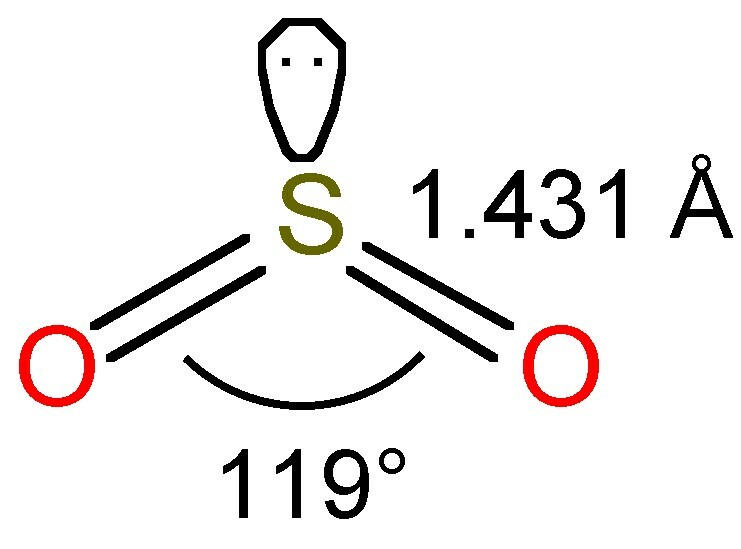 The molecular shape of #"SO"_2# is not trigonal planar. What is the shape of #"CH"_4#? The four bond pairs are arranged about the #"C"# atom, pointing toward the corners of a regular tetrahedron. The 109.5° angle is the same for all #"H-C-H"# bond angles and is called the tetrahedral bond angle. The shape of the #"CH"_4# molecule is tetrahedral. ii. #"AX"_3"E"# — three bond pairs and one lone pair. What is the molecular geometry of #"NH"_3#? The central atom, #"N"#, has four groups bonded to it: three hydrogen atoms and a lone pair. The electron pair geometry of #"NH"_3# is tetrahedral. The #"NH"_3# pyramid has a triangular base. The greater repulsion of the lone pair causes the #"H"# atoms in #"NH"_3# to be bent closer together than the normal tetrahedral angle of 109.5°. In #"NH"_3# the observed #"H-N-H"# bond angle is 107.3°. What is the molecular geometry of #"H"_2"O"#? The central atom, #"O"#, has four groups bonded to it, two hydrogen atoms and two lone pairs. The electron pair geometry of #"H"_2"O"# is tetrahedral. The #"H-O-H"# bond angle is less than that in #"NH"_3#, partly because of the greater repulsions caused by two lone pairs. In water, the observed #"H-O-H"# bond angle is 104.5°. All bond angles in #"AX"_2"E"_2# molecules are significantly less than 109.5°. What is the molecular shape of #"PCl"_5#? Atoms past #"Si"# in the Periodic Table can “expand their octet” and have more than eight valence electrons. Here, the #"P"# atom has ten valence electrons. If you view the #"P"# atom at the centre of a sphere like the earth, you have one #"Cl"# atom at the North Pole, one #"Cl"# atom at the South Pole, and three #"Cl"# atoms spread evenly around the equator. 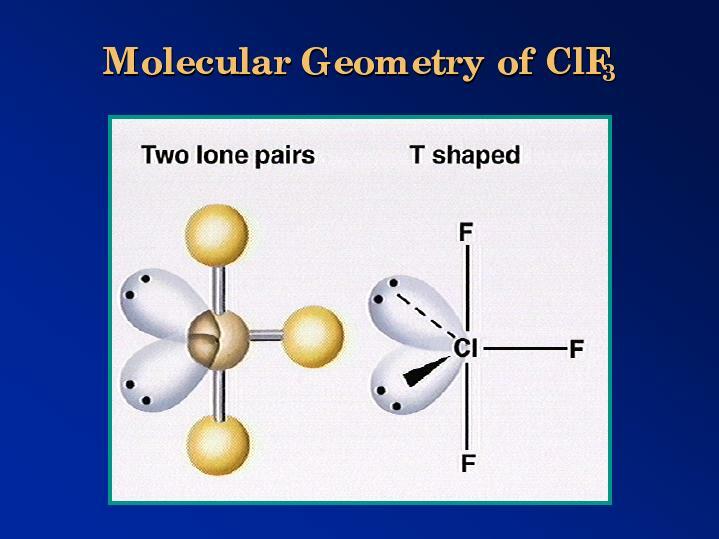 Note that the #"Cl"# atoms occupy two types of positions. The two #"Cl"# atoms that are on a straight line that passes through the #"P"# nucleus are said to occupy axial positions. The other three #"Cl"# atoms are in equatorial positions. If you join the #"Cl"# atoms by straight lines, the diagram looks like two trigonal pyramids joined together at the base. 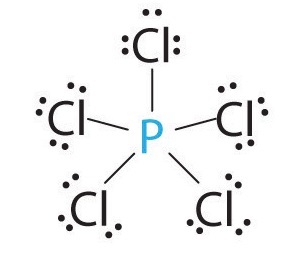 The #"PCl"_5# molecule has a trigonal bipyramidal shape. The axial #"Cl"# atoms are at angles of 90° to the equatorial #"Cl"# atoms, while the equatorial #"Cl"# atoms are at angles of 120° to each other. ii. #"AX"_4"E"# — Four bond pairs and one lone pair. What is the molecular shape of #"SF"_4#? If you turn the molecule on its side, it looks like a see-saw, with the axial #"F"# atoms at the ends, and the equatorial #"F"# atoms acting as the pivot. The axial #"F–S–F"# bond angle is 173.1° rather than 180°, because of the lone pair of electrons in the equatorial plane. The equatorial #"F-S-F"# bond angle is compressed to 101.6° from its normal value of 120°. What is the molecular shape of #"ClF"_3#? Actually, the molecule has a “distorted-T” shape because the two lone pairs reduce the #"F-S-F"# bond angle from 90° to 86.98°, and the #"F-S-F"# bond angle across the top of the T is reduced from 180° to 173.96°. What is the molecular shape of #"XeF"_2#? The three lone pairs occupy the three equatorial positions, so what you have is a xenon atom with three lone pairs pointing toward the corners of an equilateral triangle, with one #"F"# atom below the triangle and another above. The result is a linear shape for the #"XeF"_2# molecule, and the #"F-Xe-F"# bond angle is 180°. What is the molecular shape of #"SF"_6#? Every #"F-S-F"# bond angle is 90°. What is the structure of #"IF"_5#? Four of the #"F"# atoms are at the corners of a square, and one is directly above the #"I"# atom. Lines connecting the #"F"# atoms form a pyramid with a square base, so the shape is square pyramidal. The #"F-I-F"# angles between neighbouring #"F"# atoms are 90°. What is the molecular shape of #"XeF"_4#? Since the four #"F"# atoms are at the corners of a square, the molecular shape is square planar. The #"F-Xe-F"# bond angles between neighbouring #"F"# atoms are 90°. There are no molecules that belong to the #"AX"_3"E"_3# system. No stable #"AX"_2"E"_4# molecules are known.